Old Mill’s Michael Smith puts up a shot as Dunbar’s Jamal West attempts to block during Saturday’s boys’ basketball contest at the Basketball Academy. The No. 4 Poets improved to 9-0 with a 48-32 decision over the 18th-ranked Patriots at Morgan State University’s Hill Field House. After a disappointing loss earlier this week, McDonogh School boys’ basketball coach TJ Jordan challenged his team to get back to the intangibles that has made it successful. The No. 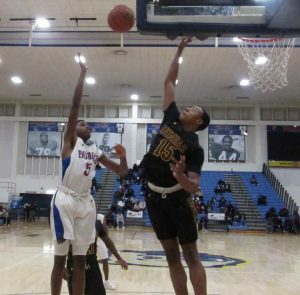 17 Eagles responded, defeating 10th-ranked Perry Hall, 46-45, in the final match of the 22nd Baltimore City Public Schools Basketball Academy at Morgan State University Saturday evening. No. 4 Dunbar, eighth-ranked Lake Clifton, Edmondson and New Town were victorious in boys’ action while 11th-ranked Patterson fell to Prince George’s County’s Riverdale Baptist. Mount Carmel, No. 8 Western and 10th-ranked Poly were winners in girls’ play. After his team’s blowout loss to Western Friday, Mount Carmel coach Rob Long said his team needed some wins to justify its ambitious non-league schedule. The IAAM B program got a notable victory, topping City College, 49-40. Junior guard Ariana Alleyne scored a game-high 20 points for the Cougars (6-9 overall), and Jaylah Lewis added 14. Rachel Nicholson led City with 15 points. In a game featuring 71 free throw attempts, Mount Carmel built a 25-13 halftime advantage before holding off the Baltimore City stronghold Knights (8-3). The Cougars hit 18 free throws in the final quarter after scoring a basket and missing all five free throw attempts in the third. The win snaps a five-game losing skid for the Old Eastern Avenue school, which reached its bracket final at the Carolina Invitational Tournament during the holiday break. Western (8-1) got 16 points from Temple University commit Jasmen Walton in a 62-34 win over Franklin. Ayana Boozer finished with 15 points for Franklin (5-4). Poly improved to 7-1 with a 58-13 rout of defending Class 2A state champ New Town. Janya Lilly led the Engineers with 15 points. After needing overtime to win Friday, New Town boys cruised to a 60-39 victory over Chapelgate Christian Academy. Sophomore guard Martaz Robinson finished with 15 points for the Titans (8-2). The Owings Mills school raced out to a 40-22 halftime advantage. Blake Hatcher had 11 points for Chapelgate Christian (11-8), which was coming off an overtime loss to undefeated and 19th-ranked Indian Creek School Friday evening in MIAA B play. 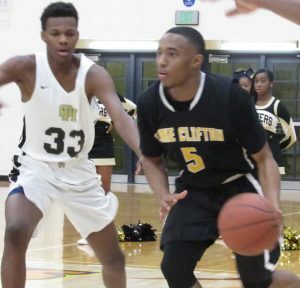 Lake Clifton rebounded from Friday’s loss to Mount Carmel with a 56-49 victory over Oxon Hill. Alphonso Barney and Chauncey Smith each scored 14 points for the Lakers (8-2). The east Baltimore school scored the first nine points, but Oxon Hill rallied. The Lakers claimed a 32-24 halftime advantage and never trailed again. Lake Clifton’s Benjamin Carter pushes the ball downcourt as Oxon Hill’s Issac Curry chases. Carter scored 12 points as No. 7 Lakers won. Benjamin Carter finished with 11 points for Lake Clifton. Nayshone Kane led Oxon Hill (8-3) with 14 points. Edmondson handed sixth-ranked Milford Mill Academy a second straight loss with a 53-50 decision. Teon Gardner scored 18 points for the Red Storm (5-3), and Keith Bolden added 12. Trailing 34-24 at halftime, the Baltimore City school went on a 17-6 third quarter run, capped with an Antonio Fliggins’ jumper, for a 41-40 lead entering the fourth. With Edmondson clinging to a 51-49 advantage, Gardner converted two free throws with 3.6 seconds remaining. The Red Storm lost to Oxon Hill Friday. Jordan Goodwin finished with 19 points for Milford Mill (7-2), which blew a 10-point fourth quarter lead Thursday against Dunbar. Patterson was unable to hold a 10-point halftime advantage as Riverdale Baptist scratched out a 63-59 victory. Donvann Toatley scored a game-high 23 points for the Crusaders (14-6), ranked No. 11 in the District region by the Washington Post. The Upper Marlboro school went up 61-59 on Tobi Bello’s baseline jumper with 39 seconds left in regulation. Ty Thomas missed a runner for Patterson, and Toatley, a Tennessee-Chattanooga recruit, converted two free throws with 14.1 seconds remaining. Daesean Jones had 20 points for Patterson (4-5), and sophomore forward Issac James finished with 18. The defending Class 2A state champ played without junior point guard Gerard Mungo, who’s temporarily sidelined with a pulled hamstring. Dunbar remained undefeated, smothering No. 18 Old Mill, 48-32. Senior wing Da’Shawn Phillip had a game-high 20 points for the Poets (9-0), and Jamal West added 12. The Orleans Street school went on a 19-0 run in the third to establish a 34-15 advantage. Dunbar held the defending Anne Arundel County champs without a field goal for nearly six minutes. Senior post Hollique Johnson had 10 points for Old Mill (8-4), coming off one of its best offensive showings Friday against No. 7 Woodlawn. The Patriots came into Saturday’s match averaging 60 points. McDonogh withstood a late close from Perry Hall in the finale. Junior guard Drew Green scored 20 points for McDonogh (12-5), and Florida recruit Noah Locke added 15. 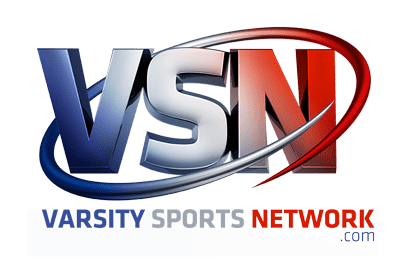 It’s the 11th win in 13 games for the MIAA A program which gave up a season-high 72 points in a league loss at Calvert Hall College Wednesday. After winning at surging No. 15 St. Vincent Pallotti Friday, the Eagles held the defending Class 4A state champions to a season-low in points. The Eagles, with their tallest player at 6-4, held their own on the boards and craftily attacked the Gators’ defense. McDonogh led by as many as 13 points in the first half, and 10 late in the third. McDonogh led 46-39 after Lukas Michaelson dropped a jumper over Anthony Higgs in the paint with 2:54 left in regulation. Perry Hall closed the deficit to 46-45 with 26 seconds remaining on Laquill Hardnett’s tip-in. The Gators fouled four times before getting McDonogh to the free throw line for the one-and-one with 6.6 seconds left. Locke missed the front end, but Terence Johnson’s 3-point attempt from about 40 feet missed at the buzzer. The Eagles dictated from the opening tip as Green scored off a drive and dropped a pull-up jumper for a 20-10 advantage early in the second. McDonogh upped the lead to 31-18 as Locke, arguably the area’s best shooter, hit a baseline jumper. The Eagles had a 37-27 lead late in the third quarter after Green’s basket, but Perry Hall began chipping away. The Gators pulled to 44-39 on Hardnett’s 3-pointer with 4:13 left in the regulation. The Baltimore County champions stopped McDonogh on back-to-back possessions, only to turn the ball over. Higgs, who’s verbally committed to Mississippi, led Perry Hall with 20 points. After an impressive showing against Riverdale Baptist Friday evening, Perry Hall only led after the opening basket Saturday. 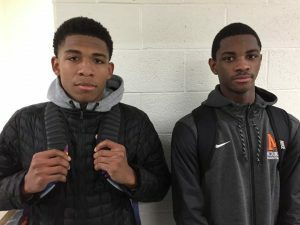 Noah Locke (left) and Drew Green combined for 35 points for McDonogh Saturday evening. The No. 17 Eagles knocked off 10th-ranked Perry Hall in the final contest at the 22nd annual Basketball Academy. Western – Rideout 2, Walton 16, Johnson 9, Scott-Pearson 7, Faulkner 3, Waters 7, Pollard 8, Fisher 3, Hawkins 7. Totals 26 6-13 62. Franklin – Booze 15, Doss 8, Adedeji 1, Polson 6, Montanye 1, Ceroll 3. Totals 9 15-33 34. City – Henson 8, Ford 5, R. Nicholson 15, Roman 2, Hardison 7, A. Nicholson 2. Totals 10 17-27 40. Mount Carmel – Lewis 14, Alleyne 20, Carter 5, Alexander 1, West 7, Brim 2. Totals 12 24-44 49. Poly – Wilson 9, Gross 7, Glenn 7, Lilly 15, Ridgeway 2, Stokes 5, Robinson 5, Jones 4, Townes 4. Totals 24 8-13 58. New Town – Pennix 2, Petty 6, Ross 1, Anderson 2, Brown 2. Totals 4 5-9 13. Dunbar – Hunt 5, Lewis 2, McCormick 9, Phillip 20, West 12. Totals 18 9-17 48. Old Mill –D. Johnson 8, H. Johnson 10, Smith 2, Thames 3, Savage 3, Robinson 6. Totals 13 3-4 32. Perry Hall – Hardnett 9, Gravette 4, Walker 4, Holley 2, Higgs 20, Cloude 6. Totals 17 8-14 45. McDonogh – Locke 15, Green 20, Jacobs 2, Thomas 3, Michaelson 4, Billups 2. Totals 20 3-5 45 46. Edmondson – Ruffin 7, Evans 5, Gardner 18, Bolden 12, Jones 4, Fliggins 7. Totals 19 10-17 53. Milford Mill – Milton 10, Parker 11, Turner 7, Goodwin 3, Goodwyn 19. Totals 17 11-24 50. New Town – Carter 3, Collins 5, Robinson 14, Guerrero 6, Cameron 7, Ferrell 8, Warren 2, Mills 8, Outlaw 7. Totals 20 16-20 60. Chapelgate – Dickerson 9, Hatcher 11, Wise 1, Morant 4, Boardman 2, Heard 4, Wesley 3, Young 2. Totals 12 11-22 39. Lake Clifton – Barney 14, Carter 11, Smith 14, Harrison 4, Brown 2, Gray 14. Totals 19 15-26 56. Oxon Hill – Snider 10, Parker 4, Stephens 3, Kane 14, Polite 4, Miller 1, Guerrero 1, Taylor 1, Henderson 2. Totals 17 11-23 49. Riverdale Baptist – Toatley 23, Grossf 4, McCullough 10, Creek 16, Gaskins 2, Bello 6, Grimes 2. Totals 24 11-18 63.